It is possible to work outside the home and still homeschool! I have done it and I want to share my tips for planning your homeschool when you work. Can you really homeschool and work, too? “But I can’t homeschool – I have to work!” I’ve heard it over and over. And I’ve thought it myself – “It might just be easier if I put them all in public or private school.” As a single mom, I have to work in order to pay the bills and keep food on the table. Sometimes it seems overwhelming to think about one more thing to do in my day. For several years, I worked an 8am-5pm job at a CPA firm, and during tax time it was usually 7 pm before I would be home. I am blessed to have a supportive family who embrace homeschooling wholeheartedly. I would drop the kids off at my Mom’s every morning, and she did the bulk of the everyday homeschooling. But this year, I will be building a bookkeeping business from home, and our schedule will look different than last year. Either way, it can be challenging to work and homeschool at the same time. Should I Homeschool when I work? Homeschooling is a personal family decision. I don’t think every family has to homeschool, and maybe some families shouldn’t homeschool. But I have been called to homeschool my kids. I feel like God has given me a responsibility to raise my kids in the nurture and admonition of the Lord. And for now, that means homeschooling them. Every time I have prayed about putting them into school, I have felt like it would be the wrong thing to do. So until God leads me to do otherwise, I will be homeschooling my children. So, if you feel like you are called to homeschool but have to work outside the home or are a work-at-home mom, I have some tips that might help you. And they might help you even if you don’t work! If God has called you to this job, He will be faithful to complete it. I can’t tell you how many times I have been at my wit’s end, and God has always provided. Whatever your needs are, God has the answer. Maybe you don’t know which curriculum to use. Pray. Don’t know how you are going to pay for the curriculum? He owns the cattle on a thousand hills; just ask Him. If you need a homeschool buddy, God can send one. When you don’t think you can do this anymore, talk to God about it. I have had many, many heart to heart talks with God when I didn’t know how I could go on, and I always feel better after taking my troubles to Jesus! Many homeschool curriculums require lots of teacher interaction. While I am sure those curriculums are wonderful, I have to find things that don’t require much work from me. I just don’t have the time to sit with each kid for hours a day. This becomes easier the older they get. Until a child can read well, there will have to be someone to read the directions to them. Thankfully, usually younger grades don’t require as much time to complete. We have successfully used Saxon Math and Teaching Textbooks for Math, Learning Language Arts through Literature, Apologia Science, and Mystery of History and Beautiful Feet Books for History. More on that in another post! When I was working a regular office job, I sometimes felt like I didn’t have a good handle on what they were learning. Independent learning is wonderful, but they still need some accountability for actually completing the work assigned. So I started meeting with them every Friday evening when I got home from work. There were meetings that we had to skip or postpone, but I felt like I was more involved in their schooling and we could catch mistakes before they got out of hand. I think this year will be a little different since I will be mostly working from home, and will be with them most of the day. I’ll give you an update on that sometime soon, after we have gotten back into the swing of school again. Your homeschooling doesn’t have to happen between 9 and 3 every day. Maybe you will do your homeschooling in the evening. You might work evenings and school first thing in the morning. Maybe the bulk of your schooling is done on your days off. There is no rule that says your homeschool has to look just like someone else’s. Everyone is busy nowadays, but as working homeschool moms we have to be even more mindful of the time. I try to set up our schedule by 9 week terms. It helps the kids to know what should be done by a certain time, but gives me a little wiggle room if I need to adjust things a bit. 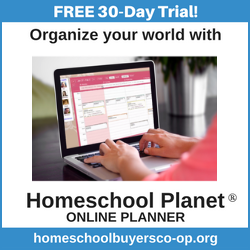 I have used Homeschool Planet for years to keep myself and the kids on track. It gives them a checklist for the week, and they are responsible to finish it before the end of the week. In all of your scheduling and planning leave room for flexibility. Maybe the whole family gets sick, or you have a huge project that takes more of your time than you think. You need to be able to change your schedule when something unexpected arises. One of the reasons I love Homeschool Planet so much for planning is that it can reschedule whole days or just one subject with ease. I have tried paper planners, but I just get aggravated when my plans go awry. And they always do at some point in the year! This is something I need to work on. It’s easier to keep the dishes washed when you don’t have too many dishes. Toys are easier to pick up when there aren’t a million of them. Laundry doesn’t pile quite as high if everyone has a few less outfits. It is my goal to simplify this year… I’m working on it. I have a long way to go though. Selena at Look! We’re Learning did a great 10-day Series on Minimalist Homeschooling a few weeks ago. It has some really great tips for simplifying your homeschool. I have been so blessed to have family and friends that have helped me since becoming a single mom. It might feel difficult to find help if you are not blessed with supportive family that lives near. But you aren’t Superwoman, remember? If you don’t have family nearby, maybe you can find a homeschool family that will team up to do a co-op or that would allow your kids to come to their house a few days a week. Or you might be able to find a group of homeschoolers that can encourage you when you want to give up. Even finding some encouraging blogs like this one can help you when you are feeling down. And if you are ever discouraged and need an encouraging word, please contact me. I would love to pray with you. My kids have always had responsibilities around the house. I feel like they need to learn how to work hard in order to become responsible adults. But after I went to work full-time, my kids had to learn to take on a little more around the house. There are jobs they can do that take a HUGE load off of me, so that I can do work that will be able to support us. I hope you are encouraged through this post that you can do this! If God has called you to homeschool your kids and you still have to work, he will help you be able to do it! Do you work and homeschool? How do you keep up with everything? I would love to hear your thoughts! Please share your thoughts in the comments. This post is a part of the Homeschool Blogging Network’s Monthly Blog Hop! Be sure to visit all of these great blogs for more tips about scheduling and routines! I work from home, too. It’s not easy, but it’s worth it. I like what you said about relying on God and getting organized – I’m going to need a lot of divine help with that this year! Thanks, Ginny! I agree – it isn’t easy! You can do it! Amy, I like the idea of a short-term plan and the Friday meetings! Simplifying is definitely something I have trouble with. In every area of my life. I’m going to check out that minimalist homeschooling series and see if I can find it in me to follow some of the advice!